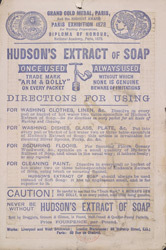 This is an advertisement for Hudson's soap. Soap has been manufactured for thousands of years, there are even examples of people using it in the Bible but it was not until after the tax on soap was lifted in 1853 that more and more people started using it. Until the 1880s soap had been made locally by chemists and shopkeepers would have cut small blocks from the original slabs for their customers. Lever introduced a branded soap in the 1880s and marketed it nationally. Further advances in the science of soap making meant that it could be produced cheaply and so for the first time, soap became both popular and available in great quantities.